The symptoms of feline kidney disease can come on so gradually. Pet owners often feel guilty that they hadn't noticed until they take their cat in for a routine check up only to find that their pet has lost a signficant amount of weight. Many senior cats are diagnosed with kidney disease. If you have multiple cats, it is quite common for some to have renal insufficiency as they age. Most cats will not want to eat the prescription kidney diet and this can present some challenges for pet owners. In addition, if you have multiple cats eating from the same bowl, it is important that you do not give all of your pets the same food as prescription diets are meant for the specific patient giving a young cat, for example, a low phosphorous, low protein diet is not recommended. If you are having difficulties getting your senior kitty to eat the prescription kidney diet, we highly recommend a telephone consultation with Susan Davis, holistic practitioner. She will interview you extensively and try to help you find some feasible solutions for even the most finnicky kitty! 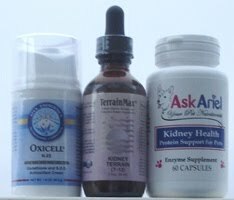 "No Pill Kidney Disease (CRF) Supplement Package"
If you have a cat, you may find that the liquid supplements such as Kidney Terrain and Renelix are easier to administer. Also, CoQ10 has been clinically proven in research studies to help the kidneys and maintain/improve creatinine levels. CoQ10 is critical but it must be bioavailable and highly absorbable (many products are NOT). Ideally, you can give your pet the Purrfect Pet CoQ10 gelcaps several times a week, alternating with the Oxicell. 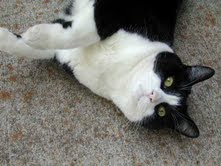 Oxicell is an easy to apply transdermal cream----great for giving cats CoQ10! Click here for handy tips on how to give your pet a pill! Holistic care can dramatically improve your pet's prognosis. Changing your pet's diet and using natural supplements can result in improvement in your pet's appetite, energy and overall well being in just a few days.